Defines the zoom of the map. Zoom level 0 shows the complete map. Defines the center of the map. with zoom 0 it"s automatically the middle of the map. Abandoned villages are displayed grey. If the checkbox is empty abandoned villages are not displayed. The Ally-Tags of marked allys are displayed on the map. The Tags are centered to the area of each ally. 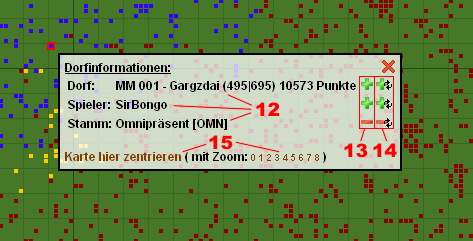 There are two way of marking tribes, players and villages. The Links "add ally", "add player" and "add village" create new input fields with those you can add map markers. Enter the coordinates into the input fields. You can choose the color of the marker clicking the colorselector. Clicking "create map" creates the map with the selected markers. On the right hand side are buttons for adding or removing markers. Clicking the plus shows the color selector for the marker. The plus or minus with the refresh icon refreshes the map immediately, the normal plus or minus adds or removes the marker without refresh. Clicking "center map here" centers the map around the selected village. Additionally you can zoom the map. Markers can be removed through emptying the input fields in the map settings (for allys select the top most entry "---") or remove the marker through the popup on the map. In the tab "language" you can select the language. This setting is stored in a cookie. By now you can choose between german, english and russian. In the "Link it!" tab you can find links as BBCode or URL for linking the map in forums. In the world map archive is a new map of the TOP 20 tribes every day. The maps are created every night (CET).